It's not only the comments that are piling up, it's also the sales these days. I've got 27 SFH sales under $550k and 35 from $550 to $900k, which is the most I've seen since I've started tracking 2-3 years ago. 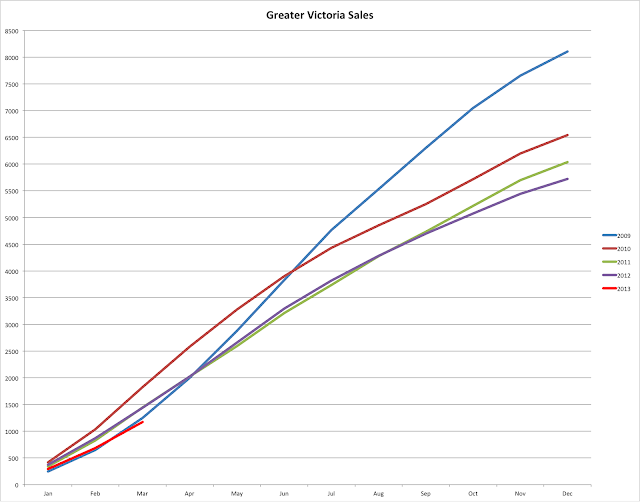 No sooner do I write an update about the low sales do they turn around. Will be interesting to see the final numbers for April. Last year around the third monday we had 417 sales. Edit: Sales would have to be accelerate significantly and be sustained for several months to catch up to last year though. So far we're 268 sales behind 2012. Interesting that you're seeing a lot of sales. In houses (East and West Saanich, Central Saanich) up to $550,000, I see 19 pending out of 171. In acreages (East, West, Central, and North Saanich, plus East and West Highlands) up to a million, I see 8 pending out of 78. Many of them have been pending since February, so they're not all recent. I guess it really is all about location, location, location, since I'm missing Oak Bay, all the parts of Victoria, and Esquimalt in my matrix - and I assume there hasn't been a sudden surge in View Royal, Langford, and Sooke. Uptick in sales = bear trap? My impression is that the lower end of the market is still slumping. There have been many midlevel quality homes coming on the market as pensioners, etc. are downsizing. These are being purchased by Victorians "moving up" the real estate ladder, and by people moving to Victoria from more expensive markets (Vancouver, Toronto, etc.). These sales are driving up the median and averages. 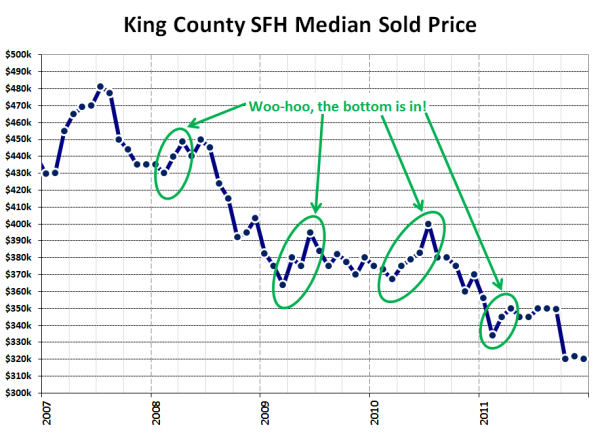 Property valuations continue to decrease. People are using their recency bias to judge the current decrease in prices as really good deals. Interesting month in sales. Instead of raising interest rates, what are the odds of the government raising the CMHC minimum down payment to 7.5% or 10%? If debt levels don't start going down. "Reduced! Out Of Town Seller wants it Sold!" These poor people continue to drop the price to sell this house. Where is the bottom of the market for these houses? It's right on the money for 85% of assessed. Will it sell now? I remember when those houses in Langford were first built - they actually seemed like an ok deal. And then they built that massive condo in their backyard. Ouch. Talk about a loss in value. Minimum really needs to be 10% down to encourage some discipline. Wow you mean assessments done last year don't reflect current market value? Who knew? "Wow you mean assessments done last year don't reflect current market value? Who knew?" Ernie, what are you? Looking to buy? Looking to sell? Instead of raising interest rates, what are the odds of the government raising the CMHC minimum down payment to 7.5% or 10%? Well, they have done it before (raise to 10% from 5%). However at this point I think it would be untenable. It would essentially remove first time buyers from the market for a year or two and crash prices. It's too late for moves like this, and I don't think there is any political appetite for changes that drastic. Are rising sales the result of more realistic pricing? if so, HHV's recommendation to make offers in the vicinity of 20% off the peak price makes sense. In which connection, 3480 Upper Terrace just went for 85% of assessment. Also, Ernie, you should contact some local realtors and let them know that saying "priced below assessed value" is a useless metric. They keep doing it for some reason. 3480 Upper Terrace...what was assessment? Re Bourne property. Just out there this am looking at a place in the area and the noise from the highway is really loud. "Re Bourne property. Just out there this am looking at a place in the area and the noise from the highway is really loud." On the Saanich Peninsula sometimes view properties have a drawback, namely an unobstructed path for noise from the Pat Bay Highway. From this property you could possibly harness the wind from passing semis. The reason is that a lot of people think assessed value means current market value, not a guess of last July 1st's market value. Thus giving the impression that the property is a "deal" at the asking price. "3480 Upper Terrace just went for 85% of assessment"
Must have been brought in by the busy "Young Life House Tour" activities last weekend. One of ten houses in the tour was at 3535 Upper Terrace, nice renovated one on the other (quieter) side of the street, with great ocean view. Not sure what you're referring to. I didn't know Langford had a plan? But they apparently have no desire to prohibit construction of the tallest condo building on the Island, which should provide business for some nearby coffee shops, barbers' shops, etc. In Oak Bay, on the other hand, more people or any kind of business development beyond the odd coffee shop or care home seems to be prohibited. What we need is an Oak Bay industrial park and some rezoning along the avenue to accommodate several thousand new residents a year. Without such an approach, Saanich and the West shore will increasingly become the focus of economic development, while the core, excluding Saanich, will become a declining backwater. That's exactly why it will cost you 600k for a 50's bungalow in Oak Bay, because they won't do that. Could it be "Boomer trigger time"...? But the image of Langford that you have linked to is, aesthetically, far superior to this. You forget the ugliness close to home because you are familiar with the more appealing vistas to be found on streets of single-family homes, and in parks and waterfront areas. But when you think of the West shore, which is so much less familiar, you think mainly the ugly strip between the iron bridge and RRU, and by that you judge the entire community, which is, in fact, leafier and altogether more salubrious than much of the core. Victoria's great mistake was to end the construction of high-rises in James Bay. Had construction continued, the core would now have tens of thousands of additional residents, and fewer poverty stricken government clerks and stenographers would have been forced to find shelter in a decaying shack in the wilds of the western communities, clogging the roads by their daily commute, thus forcing the GVA to contemplate ruinously expensive transit solutions for which a need might have been avoided. How much of Victoria's work force lives outside of the core? A serious housing decline in the boonies will affect the people you depend on to run the local economy. The 70% won't be happy about this. "In the meantime, one can argue that slightly higher mortgage rates aren’t a big sacrifice if it means keeping the Canadian housing market sound and stable. The question is whether the remote risks being targeted by Ottawa truly justify yet another new cost to mortgage consumers." Very interesting article. Thanks, Koozdra. Lol @ CS and his/her butthurt over the core. While I appreciate your passion for the West Shore, statements like these are just as silly as the raw raw raw pro-core comments you hate on so much. "In Oak Bay, on the other hand, more people or any kind of business development beyond the odd coffee shop or care home seems to be prohibited. Without such an approach, Saanich and the West shore will increasingly become the focus of economic development, while the core, excluding Saanich, will become a declining backwater." Do you really think that eventually Victoria is going to take a back seat to the western communities? ...That one day there will be some mysterious reversal of the colwood crawl and suddenly we will all be driving out there for the good jobs? Keep dreaming. Looks like we will clear 600 sales for the month. Marko, interesting news about Zoocasa. Their site is quite a bit better than MLS. ahh - the classic bull trap has arrived! Meaning the big drop should soon follow. The istanbul real estate "square meters"
what kind of surface definition istanbul real estate has been used. case in the pre-construction phase of istanbul property development.